My own experiences with pot were mainly in the distant and decadent ’70s while going to college and shortly thereafter, and then hardly at all. However it’s easy to learn about the modern 420 world, as the Internet is full of handy websites. We did a lot of research for this brief trip, both on the world of Colorado pot and where to stay. The Denver Post, Colorado’s main newspaper, offers the online magazine, The Cannabist, which covers everything and anything about the world of pot. They even have critics who sample the endless varieties of the weed and report on them. The reference site, Leafly, lists hundreds of varieties, with descriptions, their effects, and ratings by popular vote. The locations of the dispensaries throughout the state are easy to find. Want to know which hotels are 420-friendly? There’s a list of those, too. All of the dispensaries have their own websites. Some list their current offerings, making it easy to research in advance what might be good to try. Smoking the actual marijuana buds themselves. This is the most conventional thing to do. Consuming edible products that have been laced with THC, the principal intoxicating ingredient in pot. This is attractive to those who don’t like to smoke. The drawback is that it may take an hour or more to take effect, and you can’t really tell about the dose. (That is how the noted New York Times columnist, Maureen Dowd, got into trouble.) When smoking, the effect is so immediate that you can stop if it becomes too much. Consuming THC concentrates such as hash or hash-oil or similar products (with cute names like shatter, wax, and glass). These are extremely potent substances with which one must be very careful. 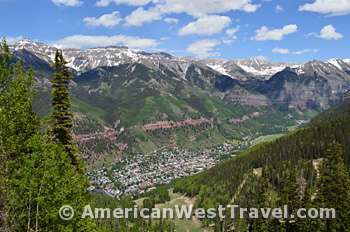 Our destination would be the resorts in far southwest Colorado, an extremely popular tourist area. 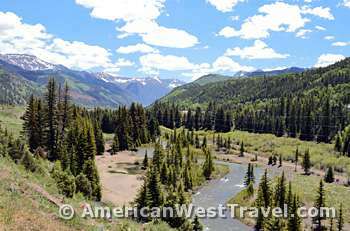 The famous ski resort of Telluride (which is also a National Historic District with a 19th century feel) amazingly has four recreational dispensaries and the next town of Ridgway, down in the valley at the foot of the mountains, has a major outlet. We eyed the Chipeta Solar Springs Resort in Ridgway which was offering a between-season half-price sale on its rooms and also indicated it had a “420-friendly” teepee on its premises, presumably meaning you could go there to consume your product. A phone call to the resort confirmed both. 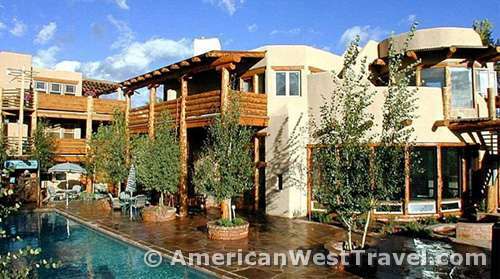 The long drive from Phoenix goes through Four Corners (where Arizona, New Mexico, Colorado, and Utah meet) with well-known area attractions such as Monument Valley, Mesa Verde National Park, and many others. 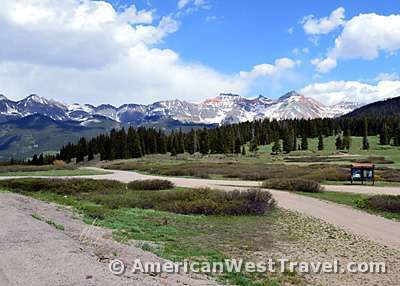 On this trip we will continue north on the western half of the scenic San Juan Skyway route which offers some of the best mountain scenery in Colorado, peaking out at Lizard Head Pass (Photo, below right), elevation 10,222 feet, before descending to Telluride. 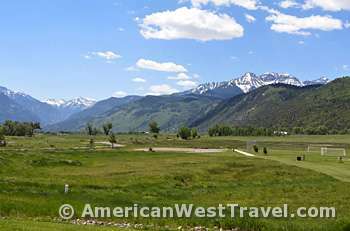 The historic mining town tucked deep into a scenic valley is a year-round favorite for tourists with skiing in the winter and excellent recreation and a wide variety of festivals and events during the summer. This is where we started our 420 shopping. Our first stop is a place called Delilah, a short walk-up in an antique building. There aren’t any hordes at the door or anything else out of the ordinary. Still, I’m a little embarrassed going inside and sort of slink in. The clerk gives us the bad news that they are sold out for the day. This irks me a little, having come so far to buy their wares. It seemed rather mom and pop to me; maybe a more substantial business would be a better choice. Our second stop is at Alpine Wellness, in a building set back from the main street and again on the second floor and again few people around. It’s a little easier to walk into this shop. Here they have a reception area to check your ID before entering the room with the pot. They do have about a half dozen varieties available for sale in very small quantities (like 1/16 ounce or 1.5 grams). This suits the many tourists who come in and want only a small amount for a short stay. After some discussion with the clerks, we purchase such a small amount of something called “Alpha-Wreck”. We made a final stop at Telluride Bud Company, a walk-down basement shop on a side street which reminded me a bit of speakeasies during Prohibition. They, too, were out of pot but we did pick up a package of edibles. It consisted of five pieces of chewy candies which the clerk advised us to break in half for a proper dose. She also showed us several varieties of hashish which seemed ridiculously expensive ($50 and up for a gram). Being late in the day, it was time to push on to Ridgway, our destination another forty miles down the road. 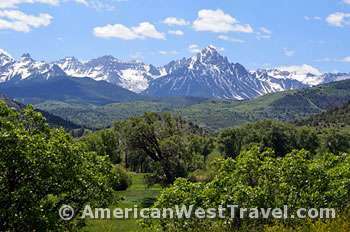 Unlike hectic Telluride, Ridgway offers a place for a quiet country vacation, with lots of open spaces and beautiful mountain views. The village had numerous century-old buildings and mostly unpaved streets. Still there were various stores and a surprising number of contemporary restaurants. And one pot dispensary: the Acme seemed more like a serious business, with stocked shelves and clients coming and going. The shop was part of a three store chain, and the proprietor seemed on the ball, offering a t-shirt room on one side and a fruit and vegetable stand on the other. Here we crazily indulged, buying some “Golden Goat” hashish, a top-rated variety according to Leafly. So now we were ready to try a little bit of everything.